Aaron Grimshaw was born in Leeds, Yorkshire in 1801 and married Rebecca Lee in 1832. In 1843, Aaron, Rebecca and their five children emigrated to Australia, arriving in Melbourne in December. Aaron and Rebecca had two more children and lived out their lives in the Melbourne area, leaving many Grimshaw descendants. Aaron’s brother, Josiah (also known as Joshua), was born in about 1809. He married Elizabeth Pemberton in Leeds in 1831 and they had two children. They apparently immigrated to Australia some time after Aaron and Rebecca and their family. Aaron and Josiah were descended from the Edward and Dorothy (Raner) Grimshaw line. Where in England is Wakefield Located? Thanks go to Murray Grimshaw and Pam Ippolito for providing most of the information on this webpage. The initial information that made this webpage possible came in May 2005 as e-mails from Murray Grimshaw, shown below. I just came across your web-site. I may have some information about Australian Grimshaws, though I understand one of our relatives in Melbourne has done up a family history. It may be that you know him – Tom Grimshaw was looking into it but has since passed away, so you may never have got in touch. 2 Grimshaw brothers sold a flour mill in Wakefield in England in 1840 or so, and moved to Australia. Aaron Grimshaw had 4 children, and Joshua Grimshaw never married. From Aaron’s descendants, we have a large contingent of relatives in Melbourne and others scattered throughout the country. I don’t have a lot of time at the moment, but if you are interested I can get more information together at a later stage and get back to you. My father has a great deal of the information in his head and in our old family bible. I haven’t had time to see if this information is on your website already – I’ll have a look when time permits. Between Dad’s memory and the history in the family bible, we should be able to get those pieces of the Australian side to do with Aaron fairly well sorted, at least historically. We might have some trouble with all of the current offspring, but we will see what we can do. Fortunately, Dad asked all the older members of the family for as much information as he could get about the family history before they passed on, so he knows more than anyone about these matters. So from a few handwritten notes of Dad’s – attached – it seems Joshua was a big man who was fond of a drink who shot his toe off at some stage. The words “confirmed adventurer” are written under his name and he was a goldminer, among other things. I’m sure Dad can fill this in some more. Joshua never married, but Aaron, the brother, did. Aaron had 3 sons, 1 daughter. Sons were John Grimshaw (another goldminer), William Anderson Grimshaw and Samuel Wilkinson Grimshaw. John had 7 children, 5 boys and 2 girls. This is where Samuel’s family bible takes over, hence the greater detail. It’s one of those eldest son to eldest son things. Samuel Wilkinson Grimshaw – 19 April 1846 to 5 February 1901. Married Kate Albion Sunderland 19 June 1883. Kate – 13 March 1858 – July 1942? 1. Samuel, 20 May 1884 – 20 May 1884 (obviously died shortly after birth). 2. Kate Desire, 18 July 1885 – ????. 3 & 4. (twins) Dora Beatrice and Georgiana Clara, 22 January 1888. Georgiana died 22 November 1938. 5. Samuel Sunderland, 30 December 1889. Married on 23 December 1914. 6. Rebecca, 23 April 1891 – 23 April 1891 (obviously died shortly after birth). 7. Thomas Edward Albert, 30 November 1894 – ???? 8. Caroline Dulcie, 13 September 1898 – ???? 9. Jack, 5 October 1900 – 5 October 1900 (obviously died shortly after birth). After this I have to check with Dad. As I understand it, Samuel Sunderland Grimshaw was my great-grandfather. His son, Lloyd Samuel Cleave Grimshaw was my grandfather. Lloyd had 10 children by 2 wives, Alma and Dorothy. Alma is my grandmother. She had, in order, Wesley Robert (Dad), Clifford, May and Mark Ian. According to the webpage “World Population of Grimshaws”, there are over 1000 people bearing the name in Australia. I suppose we should be able to place a hundred, perhaps more, of the current Australian Grimshaws into the family tree. It would be very interesting to link our Australian clan to the Wakefield and English end of the family. I note for instance that Benjamin Grimshaw married Ann Pickard on 4 July 1816 at Wakefield, Yorkshire, but there is no information as to whether they had children or not. This marriage date would perhaps fit in with a 20-something year old Joshua and a 9 year old Aaron in about 1840, and they are in the right part of England. I have had a good look through the web-site. I will have to sit down with Dad for a day and get all of the information together in the same format as the family trees that you (and others) have done up. And that was fast work with the blank webpage. 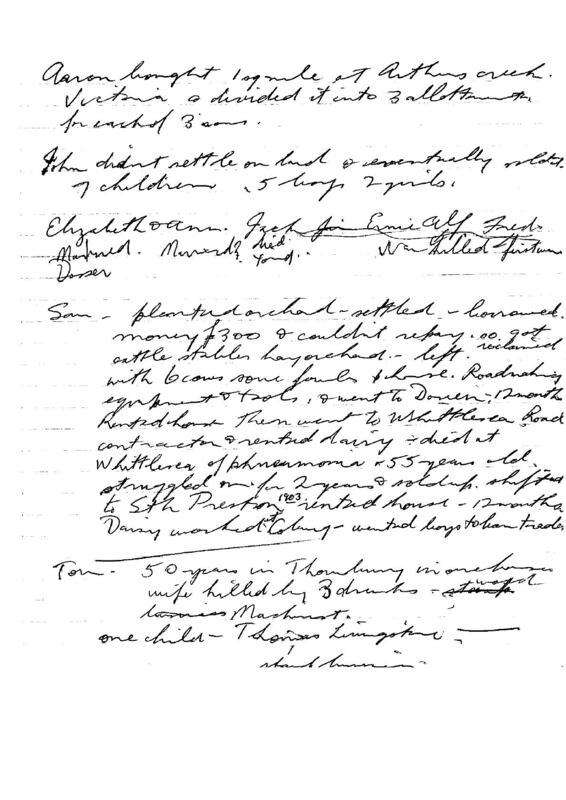 The four pages of notes (prepared by Murray Grimshaw’s father, Wesley Robert Grimshaw) alluded to in the above e-mail are shown near the bottom of this webpage. Great work Tom. It could very well be them. Especially given that in those days, the sons probably would have inherited the business when the father, John, died in 1835. It fits in with the brothers owning the flour mill – they had to own it if they sold it – Josiah could easily be Joshua and they would presumably be “of age” in 1840. And Aaron’s son John (the eldest, I think) could have been named for Aaron’s father. I didn’t think of looking at variations of the name Joshua. I’ll ask Dad as soon as possible. It would be a great thing to be able to fill in the history of one member of that family tree from 1840 to date. There’s going to be an awful lot of relations though…seems breeding was something of a family hobby for many generations. I’m not too sure we know that much about Aaron’s son John and his offspring, but we know a lot about Samuel. Dad said it sounds very much like the right line. Apparently Aaron may have married and had his children (or some of them) before he came out. Dates of birth or marriage records would certainly assist in confirming, as would any information about Aaron’s marriage, but it certainly looks right. More may come to light after we begin to get our end of the tree together. Thanks go to Pam Ippolito for providing the information on John Grimshaw and his descendants shown below. Pam sent the information in August, 2005. JOHN6 GRIMSHAW (ABRAHAM5, ABRAHAM4, JOSIAH3, ABRAHAM2, EDWARD1) was born 20 Jun 1781 in Rawdon, Yorkshire, England, and died 20 Sep 1835. He married ELIZABETH HAGUE, daughter of ABRAHAM HAGUE and JOANNA EMMOTT. She was born 18 Jun 1779 in Sheffield, Yorkshire, England/Sheffield, England, and died 1866 in Bradford, Yorkshire, England. John was the youngest child of seven born to Abraham and Eleanor (nee Whalley). He was born in Rawdon, Yorkshire, England. The Grimshaws were from a line of Quakers over many generations. John appears to have left the Quakers to pursue a very successful business in Leeds as a flour dealer and malster, his name being found in the Trade Directories from 1811 onwards. Documents show he bought quite a lot of property in Sykes Row and Kirkgate, Leeds. 14 High Court Lane, L 54 Kirkgate, Yrk. Census 1861 – There was an Elizabeth GRIMSHAW living with her daughter and son-in-law Elizabeth and William Ellison and their children Grimshaw aged 8 and Mary E aged 5. She was aged 81 which would make her the right age, and she was born in Horsforth which is close to Leeds. She was a widow. Daughter Elizabeth was aged 44, born abt 1817, which also adds up. She was born in Esholt which is near Bradford. There was an Elizabeth Grimshaw death registered in 1866 aged 87 in Bradford. I believe this is her. i. AARON7 GRIMSHAW, b. 05 Apr 1801, Leeds, Yorkshire, England; d. 28 Aug 1893, Hazel Glen, Victoria, Australia. ii. JOSIAH GRIMSHAW, b. Abt. 1809; d. 1892, Coburg, Victoria, Australia. Josiah Grimshaw was born abt. 1809 ( I have not been able to find his birth or christening in IGI, but going from his age at death he would have been born around this time. Aaron and Josiah were mentioned in 1837 Leeds directory and had taken over their father’s corn and flour mill in Leeds. Josiah would have been in his late 20’s by this time. Although Aaron and his family came out to Australia in 1843, I have not been able to find out when Josiah followed. But in 1849, he was mentioned in an article on the inquest of his 7 year old nephew who had drowned, he was named as member of the jury, as was a Mr Edwin Willis Mayger. Later it was mentioned in the following article that a Mr Mayger was the husband of his daughter. Therefore, although I have no knowledge of Josiah being married or having children, it would seem that he had. I will have to look further to find them. iii. ELIZABETH GRIMSHAW, b. Abt. 1817, Esholt, Yorkshire, England; d. 1879, Bradford, Yorkshire, England. 2. AARON7 GRIMSHAW (JOHN6, ABRAHAM5, ABRAHAM4, JOSIAH3, ABRAHAM2, EDWARD1) was born 05 Apr 1801 in Leeds, Yorkshire, England, and died 28 Aug 1893 in Hazel Glen, Victoria, Australia. He married REBECCA LEE 1832 in Whitkirk, Yorkshire, England, daughter of WILLIAM LEE and ANN BARKER. She was born 18 Jul 1810 in Bradford, Yorkshire, England, and died 20 Mar 1898 in Upper Diamond Creek, Victoria, Australia. Aaron was born at King Street, Leeds, Yorkshire, England, to John and Elizabeth Grimshaw in 1801. Aaron and his brother Josiah continued in their father’s footsteps as cornfactors 1835-1840. In 1837 Leeds Directory: GRIMSHAW, Aaron & Josiah, corn millers, Seacroft, and flourdealers. 6 Highcourt Lane and 6 Mabgate. Aaron married Rebecca Lee in 1832 in Leeds and five children were born in Leeds, 2 boys and 3 girls. John Lee in 1834, Sarah Ann in 1836, Hannah Elizabeth in 1838, Mary Elizabeth in 1840 and Benjamin Edwin abt 1842. In 1843 the family decided to emigrate to Australia. They departed Liverpool on 23 August 1843 in steerage aboard the “Glentanner”. Aaron was 42, Rebecca 33, John 9, Sarah 7, Hannah 5, Mary 3 and Benjamin an infant. They arrived in Melbourne on 12 Dec 1843. Aaron, Rebecca, John, Sarah, Ann (Hannah) and Benjamin were all named in the shipping records. Not sure why I could not find Mary but she was definitely in Victoria later, so I imagine someone forgot to put her down on list. (Port Phillip Passenger Index 1840 -1846 Page 175 ) Also aboard this ship was Robert Atkinson Grimshaw. They settled around Heidelberg District in the north of Melbourne, where he started farming. Two more sons were born in Victoria, Samuel in 1846 and William in 1849. In 1849 his second son Benjamin died aged 7 years. He had drowned in the Plenty River during lunch break at school. They appeared to live in the area of Grimshaw Street in Greensborough at some time. Later the family moved further out to farm in the district of Yan Yean, Linton, and Hazel Glen, which is now known as Arthurs Creek. In 1847 directory of Port Phillip: GRIMSHAW, Aaron Cobham, farmer, River Plenty. He was a very religious man and as there was no Wesleyan Church in the area, for a while he held Church sevices at his house in Greensborough. He also helped set up the Hazel Glen Wesleyan Church. He is mentioned in “The Quiet Hills” a book of the history of the area, by J. W. Payne. According to the book a church was built on the site in 1863, a slab walled, bark roofed structure. The original trustees were James Reid (Aaron’s son-in-law, married to his daughter Mary), Hugh Reid, John Lucas a school master from Yan Yean, Aaron Grimshaw and Brian Abbey of Linton, Henry Dosser (also Aaron’s son-in-law, married to his daughter Hannah), and Thomas Stockdale who was Henry’s uncle. For more information about Rebecca please see Aaron Grimsaw’s notes. i. JOHN LEE8 GRIMSHAW, b. 1834, Leeds, Yorkshire, England; d. 1918, Cheltenham, Victoria, Australia. ii. SARAH ANN GRIMSHAW, b. 1836, Leeds, Yorkshire, England; d. 1855.
iii. HANNAH ELIZABETH GRIMSHAW, b. 26 Mar 1838, Whitkirk, Yorkshire, England; d. 30 Nov 1878, East Linton, Victoria, Australia. iv. MARY ELIZABETH GRIMSHAW, b. 1840, Leeds, Yorkshire, England; d. Bef. 1893. BENJAMIN EDWIN GRIMSHAW, b. Abt. 1842, Leeds, Yorkshire, England; d. 12 Dec 1849, Heidelberg, Victoria, Australia. Benjamin Edwin drowned aged 7 years. He was at school and during lunch break he and a friend, John Potter decided to go down to the River Pleny which adjoined the school. Unfortunately they were not missed for 3/4 of an hour, by which time it was too late. See Coroners Inquest article from Argus dated December 15, 1849, in scrapbook. vi. SAMUEL WILKINSON GRIMSHAW, b. 19 Apr 1846, Victoria, Australia; d. 05 Feb 1901.
vii. WILLIAM DAWSON GRIMSHAW, b. Abt. 1849, Victoria, Australia; d. 1930, Melbourne, Victoria,. ELIZABETH7 GRIMSHAW (JOHN6, ABRAHAM5, ABRAHAM4, JOSIAH3, ABRAHAM2, EDWARD1) was born Abt. 1817 in Esholt, Yorkshire, England, and died 1879 in Bradford, Yorkshire, England. She married WILLIAM ELLISON. He was born Abt. 1814, and died Bef. 1891. William ELLISON aged 57, head, married, worsted manufacturer employing 19 men and 23 women and landowner. i. GRIMSHAW8 ELLISON, b. 1853, Bradford, Yorkshire, England. MARY E ELLISON, b. Abt. 1856, Bradford, Yorkshire, England. 4. JOHN LEE8 GRIMSHAW (AARON7, JOHN6, ABRAHAM5, ABRAHAM4, JOSIAH3, ABRAHAM2, EDWARD1) was born 1834 in Leeds, Yorkshire, England, and died 1918 in Cheltenham, Victoria, Australia. He married MARY YATES 1861.
i. JAMES SCOTT9 GRIMSHAW, b. 1862, Morang, Victoria, Australia; d. 1916.
ii. FREDERICK GRIMSHAW, b. 1865, Morang, Victoria, Australia. iii. JOHN WILLIAM GRIMSHAW, b. 1868, Upper Plenty, Victoria, Australia; d. 1931, Caulfield, Victoria, Australia. iv. MARY ELIZABETH GRIMSHAW, b. 1870, Collingwood, Victoria, Australia. v. EVELYN GRIMSHAW, b. 1873, Collingwood, Victoria, Australia; d. 1874, Collingwood, Victoria, Australia. vi. ALFRED HENRY GRIMSHAW, b. 1877, Upper Plenty, Victoria, Australia. vii. ANNIE REBECCA GRIMSHAW, b. 1881, Whittlesea, Victoria, Australia. 5. SARAH ANN8 GRIMSHAW (AARON7, JOHN6, ABRAHAM5, ABRAHAM4, JOSIAH3, ABRAHAM2, EDWARD1) was born 1836 in Leeds, Yorkshire, England, and died 1855. She married JAMES ARDISH. Sarah Ann had a daughter in 1855 at the age of 18. According to birth certificate father was James Ardish. Unfortunately neither Sarah or her newborn also named Sarah survived. i. SARAH9 GRIMSHAW, b. 1855; d. 1855. 6. HANNAH ELIZABETH8 GRIMSHAW (AARON7, JOHN6, ABRAHAM5, ABRAHAM4, JOSIAH3, ABRAHAM2, EDWARD1) was born 26 Mar 1838 in Whitkirk, Yorkshire, England, and died 30 Nov 1878 in East Linton, Victoria, Australia. She married HENRY DOSSER 31 Oct 1861 in Greensborough, Victoria, Australia, son of WILLIAM DOSSER and MARY STOCKDALE. He was born 19 May 1839 in Lockington, Yorkshire, England, and died 19 Aug 1883 in Linton, Victoria, Australia. Hannah Elizabeth (sometimes Anne, Annie, Anna) was born in Leeds, Yorkshire, England in 1838. She was the third child of seven born to Aaron and Rebecca (nee Lee). All seven children survived infancy. In 1843, when Hannah was 5 years old, her family emigrated to Australia. They departed from Liverpool on the “Glentanner” on 23rd August 1843. As well as her parents there were her brother John aged 9, sisters Sarah aged 7 and Mary aged 3 and baby brother Benjamin aged 1. They arrived in Melbourne on 12th December 1843. They settled around the Greensborough, Arthur’s Creek and Heidelberg area. Two more sons were born, Samuel Wilkinson in 1846 and William Dawson in 1849. This was before birth registration started in Victoria, so I have been unable to find any more than Victoria for their births. In 1849 her younger brother Benjamin died aged 7, he was drowned in Plenty River. Hannah married Henry Dosser on 31st October 1861. She was 23 and Henry was 22. His occupation was a farmer and his address was Reid’s Creek. They were married at the Wesleyan Chapel in Greensborough. Her address at the time of marriage was Linton (Arthur’s Creek). Both their fathers on cert were listed as farmers. Hannah and Henry had 6 children. William Aaron Henry (Named after both his grandfathers and his father), was born in 1863. Mary Louisa (Louise) was born in 1865, Emily in 1867, Reuben Hedley (Ted) in 1869, Elizabeth Jane (Liz) in 1871 and Maria Ellen (Nellie) in 1875. They were all born in the same area around Arthur’s Creek. Henry was born in 1839 in Lockington, Yorkshire, England, a small farming community, south of York. He was the second child (and eldest son) of ten children born to William and Mary (nee Stockdale). On January 6, 1858, at the age of 18 he left Liverpool on the “Macaulay” bound for Melbourne. He left his family behind, although his uncle Thomas Stockdale was living in Melbourne. In 1860, his parents and 6 surviving siblings arrived in Melbourne. His youngest sister then was just 1 year old. They settled in the Arthur’s Creek area – farming. Henry and Hannah had 6 children, 4 girls and 2 boys, between 1863 and 1875. In 1874 his eldest son William died from head injuries after a fall from a horse. He was 11 at the time. In 1878, his wife Hannah died. She was just 40 years old. He was left with 5 children aged between 3 and 13 years. Henry remarried in 1879 to Martha McDougall. They had 3 sons (only 2 survived). i. WILLIAM AARON HENRY9 DOSSER, b. 22 Jan 1863, Yan Yean, Victoria, Australia; d. 31 May 1874, Linton, Arthurs Creek, Victoria, Australia. William Aaron Henry was the eldest child of Henry and Hannah Dosser. He was born on 22nd January, 1863, at Linton, Yan Yean. On his birth certificate his name is given only as William Aaron. He would seem to be named after his both his grandfathers and his father. His father is stated as Henry Dosser (farmer) aged 23, who was born in Lockington, Yorkshire, England. His mother is stated as Anna Eliza Grimshaw aged 23, born in Leeds, Yorkshire, England. The informant was his grandfather William Dosser from Linton, Yan Yean. On the same page from birth certificate is the birth of Agnes Annie Sharpe b. 4th Jan 1863. she is the daughter of John Dove Sharpe and Emma Dosser (Henry’s sister) They were also living at Linton at the time. Grandfather William Dosser was the informant for Agnes’ birth also. His headstone survives in the Hazel Glen Cemetery, Arthurs Creek, Victoria. ii. MARY LOUISA DOSSER, b. 11 Mar 1865, Linton, Arthurs Creek, Victoria, Australia; d. 04 Jul 1936, Geelong, Victoria, Australia; m. RICHARD THOMAS THOMAS, 23 Apr 1889, Violet Town, Victoria, Australia; b. 10 Jun 1863, Dog Trap Creek, Ballarat, Victoria, Australia; d. 27 Jun 1947, Belmont, Victoria, Australia. Mary Louisa (Louise) was born in Linton (now Arthur’s Creek) on 11th March 1865. She was the second child of six born to Henry and Hannah (nee Grimshaw). All her siblings were born in this area. In May 1874, when she was 9 years old, her older brother William Aaron Henry died. He had fallen from a horse near the Whittlesea Road, and died of head injuries 4 days later. William was 11 years old. in November 1878, when she was 13 years old, her mother died. She was only 40 years old. She had died of the condition called Anasarca, which was more commonly called Dropsy. She had suffered from this condition for 18 months. I can only imagine that because Louise was the eldest child, then at the age of 13, she would have had to take care of her siblings, Emily 12, Reuben (Ted) 9, Elizabeth 7, and Nellie 3. In 1879, her father remarried. Her stepmother’s name was Martha McDougall. Henry and Martha had 3 sons in 1880, 1881 and 1883. (the first son did not survive infancy). In April 1882, her grandmother Mary Dosser died, along with her baby cousin Walter. They had both been sick with diarrhoea. In August 1883, when she was 18, her father Henry died. He was only 43 years old. He died from Phthisis Pulmonalis which is an old fashioned term for tuberculosis of the lungs. He had been sick for 3 months before he died. Louise married Richard Thomas in 1889 in Violet Town. She was 24 and he was 25 at the time. They had six children, 5 girls and 1 boy. Richard was born during the Victorian Gold Rush near Ballarat. His father was a tin miner from Cornwall, and had moved his family there to make his fortune. He was one of 12 children, 3 had been born in Cornwall, but not survived, the fourth child James was born in 1855, but I’m not sure if this was in Cornwall or Victoria. His sister Margaret Ann was born at Buninyong, near Ballarat, in 1856. Another sister Elizabeth was born in 1859, followed by another sister Catherine, at Black Lead, near Ballarat in 1861. Richard was also born at the diggings, at Dog Trap Creek in 1863, which is testament to how many moves the family made trying to find their elusive gold. Martha Francis was born in Buninyong in 1865, and Johanna was also born in Buninyong in 1867. A brother John Charles was born in Buninyong in 1869 and another sister Rosina Grace in Napoleons in 1871. Richard married Mary Louisa (Louise) Dosser in 1889 at Violet Town, Victoria. He was 25 years old and she was 24. They settled at Baddaginnie, not far away, and this was where the first of their six children were born. Louise was keen on names of flowers for her daughter’s names, hence Ivy, Rose, Myrtle, Marguerite and Lily. Only their son James Henry Alan who was named after his two grandfathers James Thomas and Henry Dosser missed out on the floral name. He was known as Alan. I remember though, my Nanna, Myrtle, saying that perhaps her mother could have called him “Sweet William”. I also remember her bemoaning the fact that her sisters got the pretty flowers, such as Rose and Lily and hers was just the name of a bush. I was just a little girl at the time but I have since learnt that one of the prettiest flowering bushes is that of the crepe myrtle. Their three youngest children were all born in Benalla. Later the family moved to Geelong where he was working as a linesman on the railways at Grovedale. Later in life he seems to have added the middle name Thomas, this has been noted on certificates a few times, including his own deathe certificate. Therefore he was known as Richard Thomas Thomas. iii. EMILY DOSSER, b. 1867, Plenty, Victoria, Australia; m. JAMES FOURACRE, 1888, Linton, Victoria, Australia. iv. RUEBEN HEDLEY DOSSER, b. 1869, Upper Plenty, Victoria, Australia; d. 1947, Benalla, Victoria, Australia; m. LYDIA COOK. v. ELIZABETH JANE DOSSER, b. 1871, Plenty, Victoria, Australia; d. 1951, Melbourne, Victoria, Australia. vi. MARIA ELLEN DOSSER, b. 1875, Linton, Arthurs Creek, Victoria, Australia; d. 1946, Benalla, Victoria, Australia. 7. MARY ELIZABETH8 GRIMSHAW (AARON7, JOHN6, ABRAHAM5, ABRAHAM4, JOSIAH3, ABRAHAM2, EDWARD1) was born 1840 in Leeds, Yorkshire, England, and died Bef. 1893. She married JAMES REID 1864.
ii. FLORA REID, b. 1869, Morang, Victoria, Australia. 8. SAMUEL WILKINSON8 GRIMSHAW (AARON7, JOHN6, ABRAHAM5, ABRAHAM4, JOSIAH3, ABRAHAM2, EDWARD1) was born 19 Apr 1846 in Victoria, Australia, and died 05 Feb 1901. He married KATE ALBION SUNDERLAND 19 Jun 1883 in Greensborough, Victoria, Australia. She was born 13 Mar 1858, and died Jul 1942.
i. SAUMUEL9 GRIMSHAW, b. 20 May 1884; d. 20 May 1884.
ii. KATE DESIRE GRIMSHAW, b. 18 Jul 1885.
iii. DORA BEATRICE GRIMSHAW, b. 22 Jan 1888, Upper Plenty, Victoria, Australia; m. EUSTACE FRANK WHITCHELL, 1919.
iv. GEORGIANA CLARA GRIMSHAW, b. 22 Jan 1888, Upper Plenty, Victoria, Australia; d. 22 Nov 1938; m. ARTHUR DEKIN ALBUTT, 1925.
v. SAMUEL SUNDERLAND GRIMSHAW, b. 30 Dec 1889, Whittlesea, Victoria, Australia. vi. REBECCA GRIMSHAW, b. 23 Apr 1891, Whittlesea, Victoria, Australia; d. 23 Apr 1891, Whittlesea, Victoria, Australia. vii. THOMAS EDWARD ALBERT GRIMSHAW, b. 30 Nov 1894, Whittlesea, Victoria, Australia. viii. CAROLINE DULCIE GRIMSHAW, b. 13 Sep 1898, Whittlesea, Victoria, Australia. ix. JACK GRIMSHAW, b. 05 Oct 1900, Whittlesea, Victoria, Australia; d. 05 Oct 1900, Whittlesea, Victoria, Australia. 9. WILLIAM DAWSON8 GRIMSHAW (AARON7, JOHN6, ABRAHAM5, ABRAHAM4, JOSIAH3, ABRAHAM2, EDWARD1) was born Abt. 1849 in Victoria, Australia, and died 1930 in Melbourne, Victoria,. He married CAROLINE PALEY SUNDERLAND 1884 in Greensborough, Victoria, Australia. i. WILLIAM GORDON9 GRIMSHAW, b. 1885, Melbourne, Victoria,. ii. HANNAH ELIZABETH GRIMSHAW, b. 1887, Upper Plenty, Victoria, Australia. iii. WILLIAM SAVILLE GRIMSHAW, b. 1893, Whittlesea, Victoria, Australia. iv. THOMAS ROGER GRIMSHAW, b. 1897, Berwick, Victoria, Australia; m. ROSINA FRAUENFELDER, 1920. 10. GRIMSHAW8 ELLISON (ELIZABETH7 GRIMSHAW, JOHN6, ABRAHAM5, ABRAHAM4, JOSIAH3, ABRAHAM2, EDWARD1) was born 1853 in Bradford, Yorkshire, England. He married MARY ALICE WALKER 1891 in Wharfedale, Yorkshire, England. She was born Abt. 1859. His father William had died before this census. i. WILLIAM9 ELLISON, b. 1894, Bradford, Yorkshire, England. ii. MARY D ELLISON, b. 1897, Bradford, Yorkshire, England. iii. GEOFFREY W ELLISON, b. 1899, Bradford, Yorkshire, England. About a year after the August 2005 submittal, Pam Ippolito sent the following e-mail message with more information on Josiah Grimshaw and his family. I am writing to let you know that I have found the marriage of Josiah in Leeds, Yorkshire in 1831 to Elizabeth Pemberton. They had 2 children that I know of Ellen b. 1832 in Leeds and John b. 1836. Ellen married Edwin Willis Mayger in 1855 in Victoria, Australia, and this is the same name (Mayger) found in the articles regarding the inquest into the drowning of Benjamin Grimshaw in 1849 and the murder trial of Josiah in 1862. Elizabeth Grimshaw (Pemberton) died in 1855 in Victoria. I have attached information that I have on him. Hope this information adds to your already very impressive list on the Grimshaws. 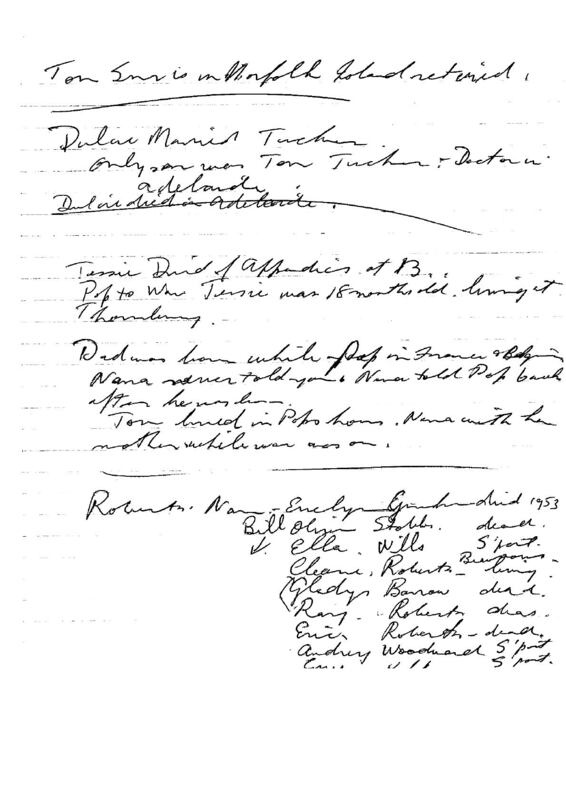 The ancestry of Aaron and Josiah Grimshaw can be found on the Edward and Dorothy (Raner) Grimshaw webpage and is shown below, with their names (and that of their sister) in bold. 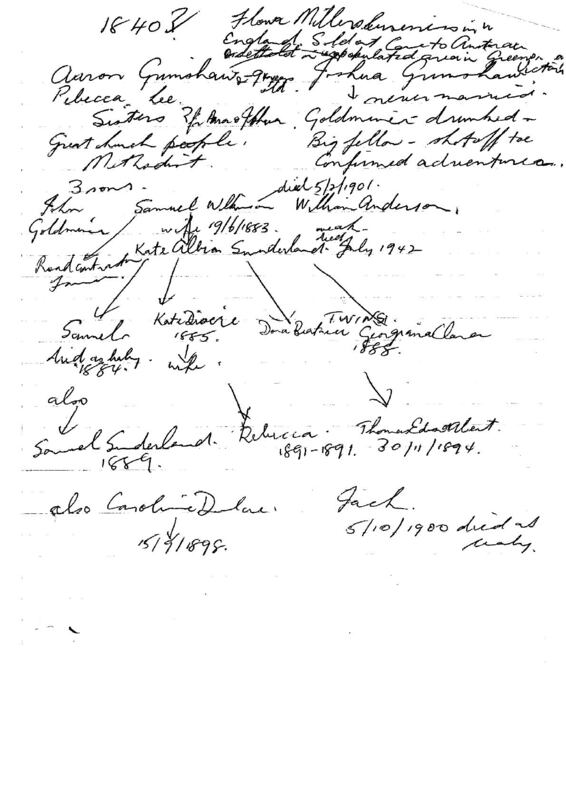 The information from Murray Grimshaw and Pam Ippolito is summarized below, showing the descendant chart of Aaron and Josiah’s parents, John and Elizabeth (Hague) Grimshaw. |–|–|–|–|–|–|–|–Emily Dosser (1867 -?) & James Fouracre. Married 1888. |–|–|–|–|–|–|–Mary Elizabeth Grimshaw (1840, Leeds, Yorkshire – Bef 1893) & James Reid. Married 1864. |–|–|–|–|–|–|–|–Dora Beatrice Grimshaw (22 Jan 1888, Upper Plenty, Victoria – ) & Eustace Frank Whitchell. Married 1919. |–|–|–|–|–|–|–|–Georgiana Clara Grimshaw (22 Jan 1888, Upper Plenty, Victoria – 22 Nov 1938). Married Arthur Dekin Albutt, 1925. |–|–|–|–|–|–|–|–|–Lloyd Samuel Cleave Grimshaw & Alma ? |–|–|–|–|–|–|–|–|–Lloyd Samuel Cleave Grimshaw & Dorothy ? |–|–|–|–|–|–Josiah Grimshaw (Abt 1809 – 1892, Coburg, Victoria, Australia) & Elizabeth Pemberton. Married in 1931 in Leeds, Yorkshire. |–|–|–|–|–|–|–Ellen Grimshaw (1832, Leeds – ?) & Edwin Willis Mayger. Married in 1855. Aaron and Josiah were from Wakefield, near Leeds in the County of Yorkshire, indicated by a pink circle in the following maps from the Ordnance Survey’s Get-A-Map website. The following notes are referenced in an e-mail from Murray Grimshaw shown above on this webpage. Webpage posted May 2005 with information from Murray Grimshaw. 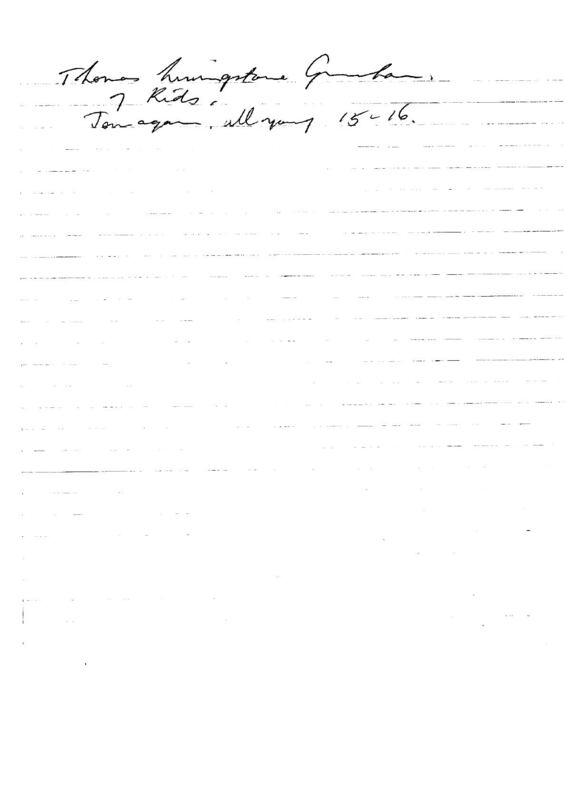 Updated August 2005 with descendant document from Pam Ippolito. Updated September 2006 with e-mail from Pam.